Late in the day, well, within a week of the match, an appeal landed on the Tartan Army Messageboard from “Padre Andrew”. He had become aware of an organisation called “Help the Children at Hal Far”. 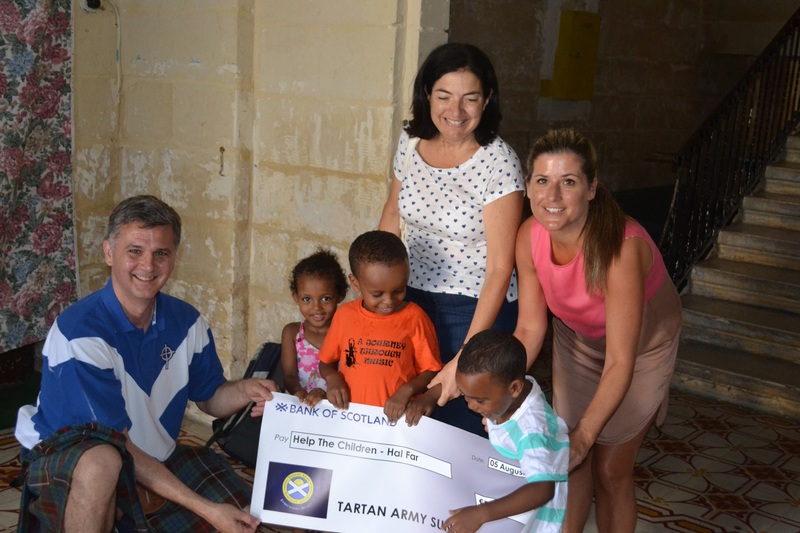 They were planning to do a cash collection for funds whilst the Scotland fans were in Malta and Padre Andre encouraged everyone to give what they could. Help the Children at Hal Far look after children and others who turn up in Malta as refugees. These people, almost exclusively women and children arrive with no possessions but the clothes on their backs. They are dirt poor. The Steering Group contacted the volunteers and offered to help when it became known that their application to appeal for cash was rejected by the authorities because of timing issues. So it was then that, very early on the morning following the match, representatives of the Sunshine Appeal accompanied by Mr and Mrs Padre Andrew went with a couple of volunteers and three Syrian children to an outfitters in the Balzan area of Malta. There, the children were kitted out in a complete school uniform. The compulsory items list issued by the school is quite extensive and everything was (it seemed to us) very expensive. The three siblings, two sisters and a younger brother, were due to start Secondary school at the end of the month. These kids had been transplanted into a foreign environment and while the Maltese are generally accepting of refugees, they still need help to assimilate into Maltese society. What they really didn’t need was to turn up in school without the school uniform. That would have singled them out even more than they already were. The volunteers told us that it was just impossible for the family to be able to afford a uniform for even one child, never mind three. We were able to supply the funds to purchase everything that was needed for the three kids. To see them shyly but proudly standing in the store showing off their new uniforms was payback indeed. This almost unplanned donation was only possible because of the support of Scotland fans and others for the Tartan Army Sunshine Appeal. We hope that you agree that your money was used appropriately.